Michelin's tire man, Bibendum, is back to promote the company's new Premier tires, which launched last year. The campaign touts the tires' ability to maintain grip and performance over their lifetime, due to an "evolving tread" design, and use of high-traction rubber compounds. 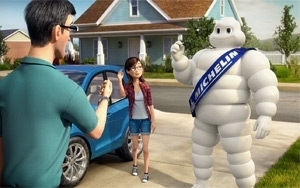 Unlike the typical creative where real tires on real cars are shown going through real puddles and snow -- usually in slo-mo -- the Michelin campaign, via TBWA\Chiat\Day and New York-based animation shop Psyop, uses Pixar-style animation to deliver the prolonged-safety message. Without going technical, the tire keeps its grip by changing its footprint as it wears. In the spot, which takes place in a fictive “Bib's World,” kind of toyland reminiscent of Buzz Lightyear, a father -- with Bibendum standing behind him -- sees his daughter off in her micro-compact car [think Smart with four seats], but before she takes off, Bibendum does his famous tire Frisbee thing, re-shoeing her car with Premiers. Off she goes, and as a voiceover explains the tire's benefits, we see her avoid collisions with other cars, and even a commuter train, as the seasons change. Michelin, which is second among the four major tire players after Bridgestone, has a premium position in the U.S. market. And as Clark points out, the brand tends to be a bit more expensive. “But performance is better, and there's better value over the life of the product.” He says that in addition to the spot, there are digital elements, PR efforts around safe driving, and dealer efforts around consumer education. In racing -- traditionally a major part of both brand building and product innovation for tire-makers -- Michelin is globally involved in rally racing, endurance sports car racing, and in the U.S. the Tudor United Sports Car Championship. The company is also official tire and exclusive tire provider of the new FIA Formula-e electric car-racing series, whose next race is in two weeks in Long Beach, Calif. Michelin has its tires and logo on all the race cars.